Epic Driving Lesson, from Edinburgh to John O'Groats and Back. Assembled at the Gyle ready for departure. Heading North over the Forth Bridge, Declan was doing his Pass Plus course hence no L plates. Declan on the M90, Pass Plus Motorway Module. Declan taking a break at Kinross. Suzanne ready to depart from Perth Northbound. North bound A9 tummies in need of food, Dornoch for Lunch anyone? Sunday Morning we depart our Hotel near Thurso and head to John O'Groats. Douglas, Suzanne and Declan at John O'Groats, someone has stolen the sign! 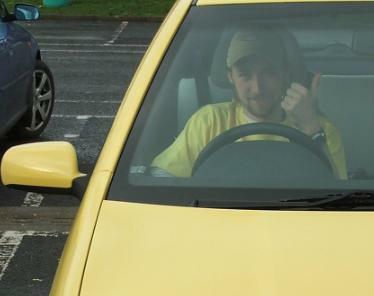 The yellow car was expertly driven the entire journey from Edinburgh and back by this trio of novice drivers. Unable to get a photo of the official sign, we parked next to the visitor centre, no one wanted to get out the car again as it was bucketing down. Our Support Team, Adam and Gail. Many thanks to both of them for their help and support. Suzanne, Gail and Adam discussing section 2 of the Road Traffic Act whilst taking a break at Helmsdale. This trip was a fundraising event for Children in Need 2007, we managed to raise a fantastic £816.50. Many thanks to everyone who sponsored the trip and those who participated.